Here’s some info about all the great options you can choose from when creating your custom instrument, plus some general overall info about specs and features! Frets allow violinists to play precisely in tune every time. 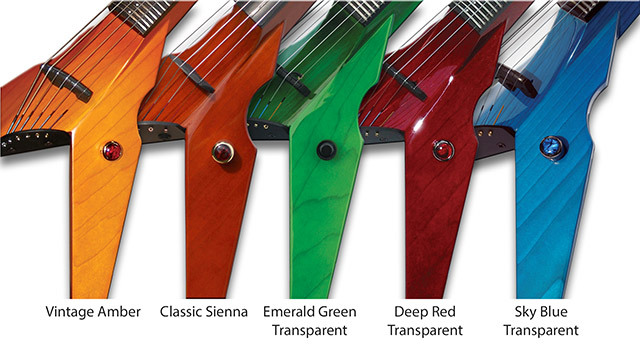 Our low profile frets will allow you to utilize traditional playing techniques without compromising the beautiful subtleties of a fretless violin. You can now play faster, more precise notes and chords with consistent accuracy. Bridge pickups: Our pickups are built into the bridge to give unmatched tone replication and isolation. Choose between our Wood pickup or Barbera pickup. Wood Tru-Tone Pickup: Powerful pickup and great tone – our exclusive design. Similar to the one Mark Wood used on his debut album, Voodoo Violince, this full-bodied pickup packs a punch that will more than satisfy the needs of most players. Barbera Pickup: Exceptional sonic range and unsurpassed tonal quality. This multi piezo bridge produces beautiful sound fit for heavy rock, classical, jazz and anything else you can throw at it. All 4, 5, and 6 string violin bridges are hybrid models (one transducer per string) but can be special ordered as TWIN hybrids for an additional charge (two transducers per string). But before you go rushing out to upgrade to a twin hybrid, you should know that we feel there is not a noticeable difference between the two. All 4, 5, and 6-string Cobra cellos come with twin hybrid pickups (2 transducers per string). Oooh! Look at all the pretty colors! This is just a sampling of some of the many custom finishes we offer. Visit our Custom Finishes Gallery to see even more. And hey – if there’s a finish you like but don’t see it here or in the gallery, just let us know! IF YOU CAN DREAM IT, WE CAN DO IT! Be sure to check out the Annie Haslam Signature Series and the Chris Compston Artist Series for options to create truly unique finishes.